She’s a little bit country; and he’s a little bit rock and roll; beloved music duo, entertainment superstars Donny and Marie Osmond have joined forces for the first time in thirty years to record a brand new album of infectious and powerful songs simply titled, “Donny and Marie” released on MPCA records. Produced by Buddy Cannon; the heavyweight songwriter has written hit songs for the late Vern Gosdin, George Strait, Billy Ray Cyrus, and Mel Tillis in addition to producing smash albums for big name stars Reba McEntire, Kenny Chesney and music legend George Jones. “Donny and Marie” sold an impressive 10,000 copies in just a half an hour on their recent QVC in studio appearance captivating both the live audience and worldwide viewers at home with their unmistakable slapstick humor and colorful personalities. Iconic songwriters Carole King, Kenneth “Babyface” Edmonds, Carole Bayer Sager, David Foster, Richard Marx, and more contributed their talents to the album as well as guest performances from pop singer/songwriter Gavin DeGraw and rock band Bon Jovi’s Richie Sambora. Three years ago, Donny and Marie made the official announcement that they would be headlining their very-own variety show at the Flamingo Hotel in Las Vegas. Upon the news of their highly-anticipated return to the concert stage, fans from all over the globe have flocked to the Las Vegas strip to witness the dynamic duo live and in person. Donny and Marie’s Las Vegas production has been so highly successful that it was renewed in 2008 for an additional two years (2011), and most recently through the end of 2012. Many well wishes to Donny and Marie for another two years of prosperous performances at the Flamingo. The standout track “Vegas Love” features Donny and Marie swapping verses about a couple that’s in love and on the run. The song is embedded with a country-music style but clearly showcases the pop/rock side of Donny Osmond. What a fitting tune for their Las Vegas engagement! “A Beautiful Life,” gives Marie an astonishing moment in the spotlight with echoing vocal accompaniment by Donny. The intricate song tells the tale of the simple things in life that don’t cost a thing. In tough economic times, the reassuring up-tempo song creates a sense of comfort and hope for the future. The track “I Have You To Thank” is hands down Donny’s finest vocal performance on the album. Maybe it’s because the song was produced by Gavin DeGraw, but Donny’s vocal range and tight riffs would make one think they were listening to Donny in the early days of his tenure. His timeless voice has never once lost its commanding range of excellence or luster. You’ll find yourself singing along with Donny and Marie on “The Good Life,” a tongue in cheek story-song about young love. The heavenly harmonies and relatable lyrics will be an instant favorite among listeners. This carefree song will surely stick in your head but it’s a good thing for sure! 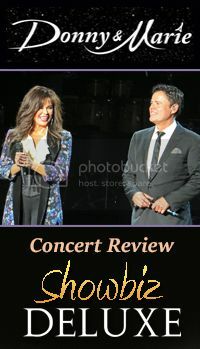 Donny and Marie turn the mood around with a trio of beautifully crafted ballads “The Best Of Me,” “Touch,” and “One Last Goodbye.” The ambiance and purity of the emotional tracks set forth a modern day relevance to the legacy of Donny and Marie’s impressive string of hit songs. The sassy “Better Off Blue” embellishes a soulful and innovative take on love gone wrong while the sensational cover of “I Swear” made famous by popular R&B vocal group Boyz II Men, is one of my absolute favorites on this record. Donny and Marie’s latest album receives FIVE stars without a doubt. Don’t hesitate purchasing this gem for it will be a fine addition to your music collection. We’d like to thank Emily Wofford, Sue Madore, and Doreen D'Agostino for this opportunity to review the album.